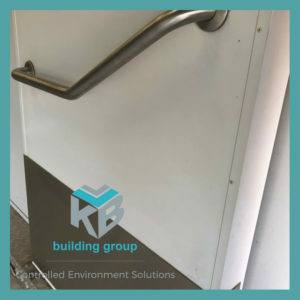 KB building group can design, manufacture, install and service custom-made hinged and sliding doors for all types of controlled environment rooms, designed to match the specific requirements of your facility. With over 25 years of building experience, our custom made doors provide smooth, durable operation and are of the highest quality. All KB building group doors are supplied and installed with a 12 month warranty on all parts and given a free maintenance service check. We are also available 24/7 for door maintenance and repairs. Where required, doors are available with a heat trace frame to prevent condensation and frosting around seals. These frames can be automated, so you can set and forget. Stainless steel finishes are an option on all doors which will add to aesthetics and increase durability and hygienic performance. Windows are available in aluminium or stainless steel and are manufactured to suit food grade and pharmaceutical regulations, or to suit specified hygiene requirements. Contact KB building group for more information about custom built doors and windows to suit your individual needs.